Mason Cash, a revered line of kitchenware favored by the British Royal Household, has returned to American shores this August, after several years’ absence. We at Pacific Merchants are thrilled to launch this British invasion as exclusive U.S. importer and distributor, and see this classic line as an opprtunity to exceed consumer expectations in a changing marketplace. When I was a boy, my mother – a devotee of Julia Child’s PBS show – purchased a set of Mason Cash mixing bowls and pudding basins. When she used the bowls, she felt as if she were cooking with her culinary idol. I can’t tell you how many times I helped my mom mix batter in those bowls for scones, crepes, and Aunt Fanne’s famous fudge brownies. I’m not alone in my memories. While rooted in over two hundred years of tradition, Mason Cash is ideally suited to today’s consumer, who yearns for products as functional and long-lasting as they are beautiful. First launched over 100 years ago, these products enjoy worldwide recognition and many have stayed within families for generations. The origins of Mason Cash can be traced back to the heart of Derbyshire, England in around 1800. Mason Cash ceramics were made from ‘white and cane’ glazed earthenware, also known as ‘yellow ware’ due to the color of the local clay. The pottery was run by a series of Master Potters, of whom the most colorful was ‘Bossy Mason’. Tom Cash acquired the pottery in 1901, and renamed the company Mason Cash and Co. The Mason Cash mixing bowl has met the test of time by combining both ergonomic and functional elements. My mom’s bowls were solid and well balanced, with raised ornamentation that made them easy to turn while whipping cream with sticky fingers, or folding egg whites into Dad’s favorite broccoli soufflé. One large bowl with a glaze the color of butterscotch sat year round on the kitchen table, brimming with fruit. Just the memory of it makes me think of apples in autumn and peaches in summer! Even more telling, is the fact that almost fifty years later, Mom still has most of those bowls in her possession. I was gratified that something of such simple beauty could also be so enduring. 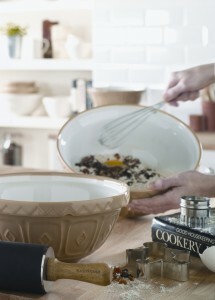 Just as well-regarded and recognizable as the mixing bowls are Mason Cash’s traditional white “pudding basins”. Microwave and dishwasher safe, these rimmed bowls maintain a tight seal with plastic wrap and are ideal for steaming. Legendary for their clean lines and high quality, they even meet the exacting standards of the British Royal Household, which uses them for Christmas puddings! A full complement of cane bakeware completes the line, with square, rectangular and oval baking dishes that are fully oven, freezer, microwave and dishwasher safe. The versatility, quality and attractiveness of Mason Cash kitchenware make it a priceless investment for any kitchen. A few weeks ago, my family and I prepared a big Sunday dinner with a brand new set of Mason Cash bowls, “bakers” and pudding basins. As my wife assembled eggplant parmigiana in the square 9 “ baking dish, I crushed garlic cloves for a tri-tip marinade with Mason Cash’s iconic mortar and pestle. My eldest daughter steamed broccoli in a 64 oz. pudding basin and arranged crudités in dainty ramekins, as the baby of the family whipped up a raspberry lemon cake batter and butter cream frosting in the 14” and 11.5” bowls respectively. As the kitchen filled with the sights and sounds of cooking, I felt a distinct sense of homecoming. The bakeware and bowls may have been new but the moment was timeless. This beautifully crafted Mason Cash stoneware is destined to be enjoyed by my family, as we create a whole new set of memories. One day my children may even use these pieces to cook with their children! For me, Mason Cash represents a return to fundamentals: kitchen essentials crafted with pride, and meant to last a lifetime.